CHICAGO--(BUSINESS WIRE)-- Today, Hyatt Ziva Los Cabos reopens its doors to guests in San José del Cabo, Mexico, following Hurricane Odile last year. Hyatt Ziva Los Cabos has been transformed, and now features a newly redesigned open air lobby, 591 suites, including 34 swim-up suites, 12 unique restaurants, bars and lounges offering cuisines from around the world, and a KidZ Club with water park. The reimagined all inclusive resort draws architectural inspiration from its Baja surroundings and the region’s history with stunning Mexican craftsmanship, which includes artwork, ceramics and ancient cave petroglyphs that are native to Baja California. Located five minutes from downtown San José del Cabo and 20 minutes from the international airport, Hyatt Ziva Los Cabos offers a selection of spacious suites including swim-up suites, family suites, and two bedroom suites. Dining is a culinary world tour with six casual and à la carte restaurants, including the newly expanded Asian restaurant that now includes a sushi bar and additional Teppanyaki tables. The Spanish restaurant delights guests with a new Tapas Bar, and the reimagined waterfront Italian Restaurant now offers an authentic brick oven for handmade pizzas. Guests can enjoy elegant French cuisine, a new beach bar and an expanded al fresco dining area around the pool that includes the addition of food carts for tasty local snacks. The two international buffet restaurants invoke a marketplace atmosphere by offering a wide array of individually chef prepared foods and a new children’s section. Additional food and beverage outlets include the Mexican Plaza with an authentic Tequila Bar and the popular Martini Bar, the Sports Bar with a dedicated terrace area offering ocean views, and a 24-hour European style deli and coffee bar. Other enhancements include a refresh of the conference space and the theater, including a dedicated registration area for meeting attendees and incentive groups. The ocean view Spa features a new hair salon, manicure and pedicure facilities and massage therapy rooms, as well as a newly enhanced Fitness Center. The resort offers complimentary 24-hour in-suite service for dining, children’s complimentary supervised programming, nightly entertainment, pool and beach butler service, as well as more than 35,000 square feet of flexible meeting and event space for conventions, business gatherings and one-of-a-kind weddings. Guests may also enjoy lounging around the cozy fire pits, food carts serving regionally inspired snacks throughout the day and evening, and tequila tastings hosted by tequila sommeliers. On site tour services provide opportunities for guests to easily experience the areas many attractions including deep-water fishing, scuba diving, world-class golf and many more thrilling adventure activities. For more information on Hyatt Ziva Los Cabos or to make a reservation visit: www.allinclusive.hyatt.com, call +1 800 760 0944 or contact your preferred travel agent. Join the conversation on Facebook and Instagram, and tag photos with #HyattAllIn. The term “Hyatt” is used herein for convenience to refer to Hyatt Hotels Corporation and/or one or more of its affiliates. 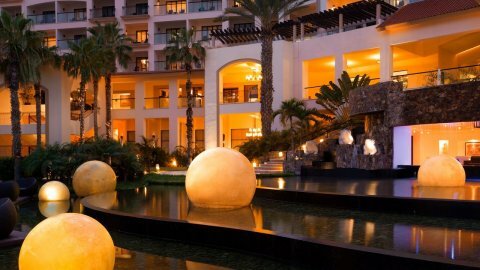 Hyatt Ziva Los Cabos is owned by Playa Hotels & Resorts B.V. and managed by Playa Resorts Management, the operational management component of Playa Hotels & Resorts. Playa’s portfolio consists of a collection of 14 premier hotels comprised of 6,142 rooms that are located in prime beach locations in Mexico, the Dominican Republic and Jamaica. Playa owns and manages Hyatt Ziva Los Cabos, Hyatt Zilara Cancun, Hyatt Ziva Rose Hall and Hyatt Zilara Rose Hall in Jamaica, Hyatt Ziva Puerto Vallarta, and Hyatt Ziva Cancun (opening fall 2015). The company also owns and operates three resorts under Playa’s brands, The Royal and Gran, and owns five resorts in Mexico and the Dominican Republic that are managed by a third party. Under an agreement with an affiliate of Hyatt Hotels Corporation (NYSE: H), Playa will pursue the acquisition or development of new all inclusive resort opportunities under two new Hyatt all inclusive brands – Hyatt Zilara and Hyatt Ziva. Playa will also have certain rights to operate Hyatt-branded all inclusive resorts in five Latin American and Caribbean countries. For more information visit www.playaresorts.com.